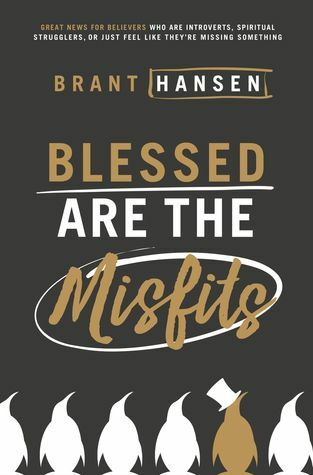 A huge thanks to Brant Hansen for writing this book, because the sort of misfits he's talking about are probably more common than any of us realise, but each keep quiet to save face. I can relate to several of his points. We hesitate to confess our misfit status because we may feel inferior, and imagine that we lack some sort of spiritual backbone. Even when we've prayed, striven and tried hard to fix ourselves for years, the deficiency still seems to be connected with us failing to measure up. Especially when we see our outgoing, full-on and super-spiritual friends and family doing what seems to come so naturally to them. This book is for the sorts of Christian misfits, oddballs and introverts who often feel we don't fit into what he calls the typical American church culture (or Australian by extension, in my case). When people talk about sensing God's loving arms wrapped around us during worship... well, some people just don't. Preachers and counselors urge everyone to 'open up to the spirit' or 'stop leaning on our intellect' but there are those who can't effect any change. And some find praying is a bit like talking into a dead walkie-talkie. Hansen is a Christian radio personality who can relate to all this, and his book convinces us to stop feeling as if we belong on the 'Island of Misfit Toys of the kingdom.' Quieter, head thinking types of Christian can honor God just as faithfully as our more emotionally switched-on friends. What a relief. I appreciate how Hansen gently puts to rest some issues which may have the potential to give us colossal guilt trips, such as failing to live up the the Great Commission or being unable to aspire to warrior type prayers. In a nutshell, Mark 16:15 wasn't necessarily meant the same way for everyone by Jesus, and even fumbling, ten-second prayer efforts have great potential. Lifting this weight of false guilt and unnecessary expectations off our shoulders is a great enough reason to read the book, but Brant Hansen also gives sound tips about how to face it whenever it creeps back, as it inevitably will. Developing the habit of ignoring our harsh and false inner monologue, and even challenging it as a liar, may do us a world of good. With the help of friendly books like this, I dare to believe it is possible. This one intrigued me when I saw it a few weeks ago. I've always been happy to call myself a misfit of sorts - I think many of us in the church are ... I will probably need to read it to better understand some of his perspectives. Really appreciate your review, Paula. Hi Ian, I found it quite surprising how many people feel they have reason to call themselves misfits, in a quiet way. I found myself relating to his words in many ways too, and was impressed by his humorous and kind way of writing.